September 2018: CEC published their proposed allocation of housing development for the District Plan for public consultation (full title: Site Allocations and Development Policies Document, or SADPD for short). This proposes 400 houses for Bollington in the period 2010 – 2030. 318 of these have already been built or are approved to be built, leaving 82 to be allocated. They have selected four of the seven sites offered to them, all of which are in the Green Belt, two of which are on the Hall Hill fields. We should remember that 98% of respondents in the Bollington Neighbourhood Plan (NP) questionnaire said that there should be no development on the Green Belt, and this was reflected in the NP adopted by CEC. Around 200 local residents attended a meeting with Bollington Town Councilors at St. Oswald’s school on 3rd October, at which there was unanimous opposition. BTC held, on 15th October, a special meeting of the full council to discuss the BTC response to the proposals. This meeting was attended by c.25 members of the community and adopted the draft response prepared by Prof. Michael Burdekin as a teplate for the BTC response to CEC. The meeting was immediately preceded by a discussion (in private) between BTC councillors and Adrian Fisher, CEC senior planning officer. Response to the CEC proposal has to be made by 22 October 2018. Everyone should respond if at all possible. Every home in Bollington has received a leaflet from BTC to explain the CEC proposals and provide information to enable the householder to respond. Please also see Bollington Town Council web site for fuller details and how to respond. Friends of Hall Hill, together with Bollington Town Council, held a public open day on Sunday 11th March 2012 at the Civic Hall. A main objective was to gather evidence of use of the footpaths going back at least 20 years, evidence which can be used to support a claim for designation of the footpaths across the Hall Hill fields. A constant stream of visitors have provided a wealth of evidence, pictures, documents, etc. which will be very valuable for establishing the case for footpaths. If you have pictures or other evidence of the use of the fields by the public (you!) over the years then do please get in touch with Nicole Roberts-Morris. A public meeting was held on Tuesday January 31st 2012 at Bollington Town Hall where 72 residents from the Hall Hill area attended and agreed to form ‘Friends of Hall Hill‘ under the leadership of Nicole Roberts-Morris to organise the community opposition to the threat of development of the fields. 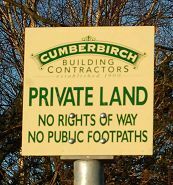 The meeting took the view that both areas of land owned respectively by by Messrs Cumberbirch and Organic Developments Ltd should remain open for public use. They are organising an application for Village Green status and for the designation of the footpaths across the lower part of the land, owned by Organic Developments, Public Rights of Way. Stella Kemp, Cheshire East Council, is drafting an Open Spaces policy for the whole of Cheshire East and she is working on the Bollington section at the moment (02/2012). In October 2011 a large part of the lower part of the land was strimmed. On 25th October the site was discussed at Bollington Town Council’s Strategic Planning Committee meeting in the presence of c.30 members of the public. It was agreed that a community group should be established and a number of activities put in train for early action. It has since been decided to re-establish the Hall Hill/ Ashbrook Road/ Lowerhouse Residents’ Association and this will be done in January 2012. If you wish to be put in touch with this group and to receive information by email please send a message. In December the new owner of the lower half of the fields, Mr Sinclair of Organic Developments Ltd, began cutting down the young trees across the site. This was stopped by the CEC Tree Officer who has since issued a Tree Protection Order (TPO) on all remaining trees on the entire fields. 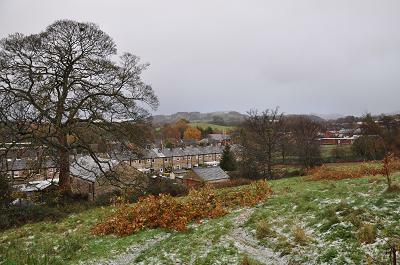 Bollington Town Council (BTC) agreed at their meeting on 10th January 2012 to proceed to establish Village Green status for the lower part of the fields. 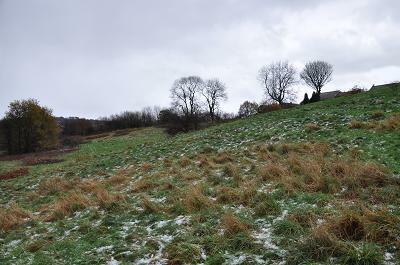 Hall Hill fields is one of the largest pieces of open land within the town and it was sold at auction on 2nd June 2011. We know the buyer to be a Mr Sinclair. 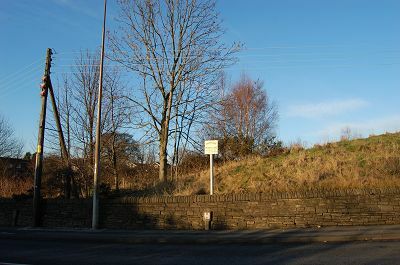 The land is located beside Hall Hill and between Henshall Road, Moss Lane, Lowerhouse and behind the properties in Albert Road. The land is in two ownerships; the top half is presently owned by Messrs H Cumberbirch & Son Ltd. The lower part was owned by another who put it up for sale. The land has been derelict for some decades and has been used as a recreational resource for which it is ideally suited. It extends across the hillside with fine views to the north. In total it is about 18 acres (c.8 hectares) in size with the lower part being about 9 acres (c.4 hectares) in size. It is scheduled for planning purposes as Green Belt. At one time, in the 1970s, planning permission was given to build on the whole site but this has long since expired. According to the Borough Local Plan published in 2004 and still extant the land is designated as Open Space, policy RT6(9) applies, and it has the additional designation of a Nature Conservation Priority Area, policy NE16 applies. James Bagley is the CEC Environment Officer responsible. The pictures above were taken in late 2011 immediately after the new owner had all the young trees cut down. All remaining trees are now protected by a Tree Preservation Order (TPO). The local community are preparing their organisation to oppose any development proposal that doesn’t meet with their approval. The Friends of Hall Hill have now been set up to manage the community response to development plans and all those in the local community with concerns should make contact with Nicole Roberts-Morris. 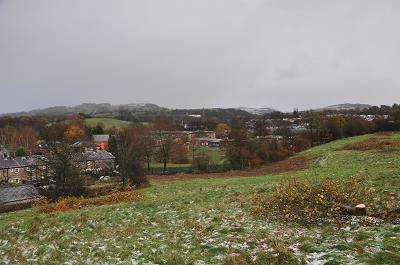 Part of the ground alongside Henshall Road, behind the trees in the picture (right), was once the domestic waste tip for Bollington Urban District Council – around the 1950s we believe. Those were the days when any old hole in the ground would do! I understand the tip extended in a narrow deep valley down the field about two thirds of the way to Dean Valley School. It is believed that the stream that originally ran open down this valley was piped in at the bottom of the tip, and no doubt provides drainage for the contents of the tip! This view is directly opposite Ovenhouse Lane. “The ‘tip’ extended from Henshall Road to the northern field boundary which is level with the boundary which marks the northern edge of the gardens of Springbank. A long time local resident said that the field was used to tip household rubbish from the housing estate. The flies from the dump used to return to the houses along Ovenhouse Lane and thus the dump was ordered to be disused. If you look on Google Earth maps, where they have the wartime RAF aerial reconnaissance footage, you can see what it looked like before the valley was used for tipping. I was told that Springbank was a good hill for flying kites on before it was built-on in 1969/1970. “The valley had ash from the mill boilers tipped and just below the soil surface and extending as far down as small boys can dig with a spade in ash and clinker. This can be found on the lower section of the field furthest away from Henshall Road. Mounds of earth stood on top of this ash in places which had been placed here in perhaps the 1960s. No more tipping took place until around 1974 when perhaps fifty lorry loads of sludge was tipped over the edge of the level section of the field (closest to Henshall Road in a line from the end of Springbank to the end of Hall Hill) and onto the ‘tip’ proper. The edge was level with the two large ash trees on the west side of the boundary. The sludge was tipped over the edge of the face and also placed around and over the level section, level with the end of the Hall Hill road. “In 1970 a large excavation was made running from the stone gate posts upon which the vehicular track ran north to the edge of the ‘tip’. Culvert pipes were laid to take the stream which runs underneath the field and used to exit from the much older culvert which exited just at the northern boundary of the ‘tip’ and ran as an open stream from the northern boundary, until it reached the boundary of the school and thence under the school and into the mill pond. This stream, too, was culverted in around the 1990s mainly because successive generations of small boys would dam the stream with sand dug from the bank and then the sand would be washed into the culvert and block it. “The original exit from the culvert to the stream was constructed of local stone and looked like it might have been 19thC. It is possible it was constructed in the 1950s in order to avoid the contents of the tip from contaminating the stream. “The school was built in 1971/72 and the stream used to flow from the northern boundary of the tip (fenced with large mature trees) to the point of the boundary with the school and thence around the contour to the west, then in the direction of the mill pond. “The factory across Albert Road was built in 1971 as WHK Die-Castings, an aluminium die casting company. “The northernmost of the two fields were kept as pasture, grazed by two horses owned by Barbers (Lowerhouse). One grey and one large chestnut horse. The horses arrived in perhaps 1974. The grey died, I cannot remember when. But the chestnut horse died in the early 1990s. At this point the pasture began to revert to scrub land. 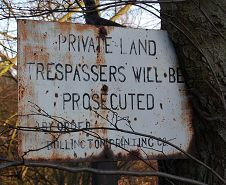 According to the very old sign, now being consumed by the tree, the land once belonged to the Bollington Printing Company. They inhabited Oak Bank Mill, where Hamson Drive is today. I’m told there was much industrial waste deposited in the tip as well as domestic waste. I have been told by one time employees of the print mill that they dumped large quantities of their chemical waste here, including printing inks.